Hello 2014! Let’s Keep Eating Pie! Welcome to Meat Filled Pastries, and the first review of 2014. While people are making resolutions about eating salads spritzed with some low-fat dressing that taste like a fairy’s fart your friendly football following pie man has but one resolution: Eat More Pie! I want to continue to smother these meat filled bad boys in brown sauce and tell you lovely folk all about them. I want to find more luxury, discover the unusual and if I’m lucky see some rather good games of football along the way. So with that said, there is no time to be wasted. Let’s rate some pie! Price: £1.20. With enough change left over to buy a Bovril from the £2 coin in my pocket this pie fell bang in the middle of the price range associated with junior level pies. Presentation: A small white napkin, sufficient to grasp the pie securely and leave a small corner to dab away the rather healthy splurge of brown sauce that I had chosen to place upon this pie. 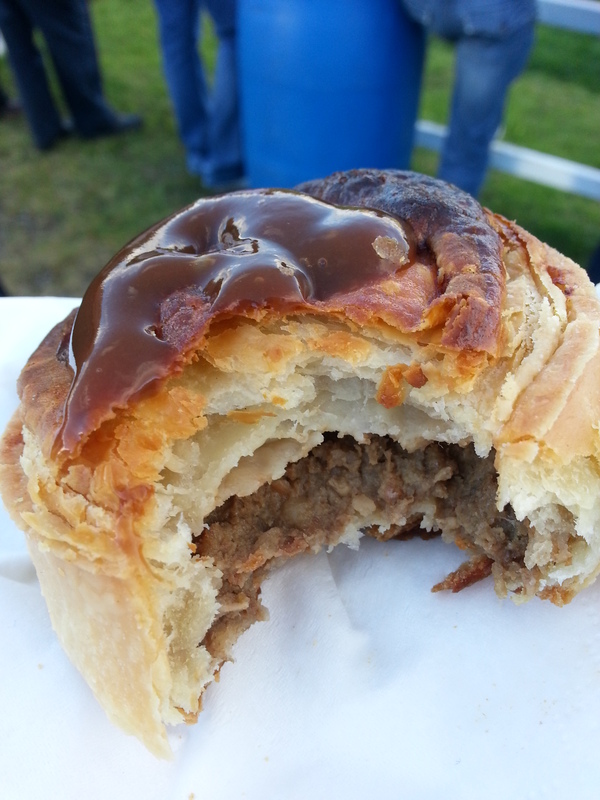 Meatiness: A mutton pie that was filled sufficiently to give the right balance of meat to pastry. The meat inside was flavoured very well and although it did not have the peppery kick my palate usually would crave it was more than compensated by the lovely savoury flavour that filled my mouth. In terms of texture the meat inside was near perfect. Falling apart just enough to allow a generous bite without fear of a meaty waterfall cascading down your arm and a puddle of meaty disappointment forming on the terracing below. I had missed my lunch and this pie certainly was helping to fill that hole. Pastry: Although the pastry may look a little underdone in the picture I can confirm that it was baked sufficiently to support the meat inside whilst allowing a bite free of any jagged edges. The top was a little loose which resulted in a small blob of brown sauce ending up on my nose at one point but that aside the pastry was a success in providing the necessary support for the meat within without being devoid of taste itself. Overall: Without having that spicy kick I normally rave about it would be understandable to expect me to say this pie was no better than average, however that was not the case. 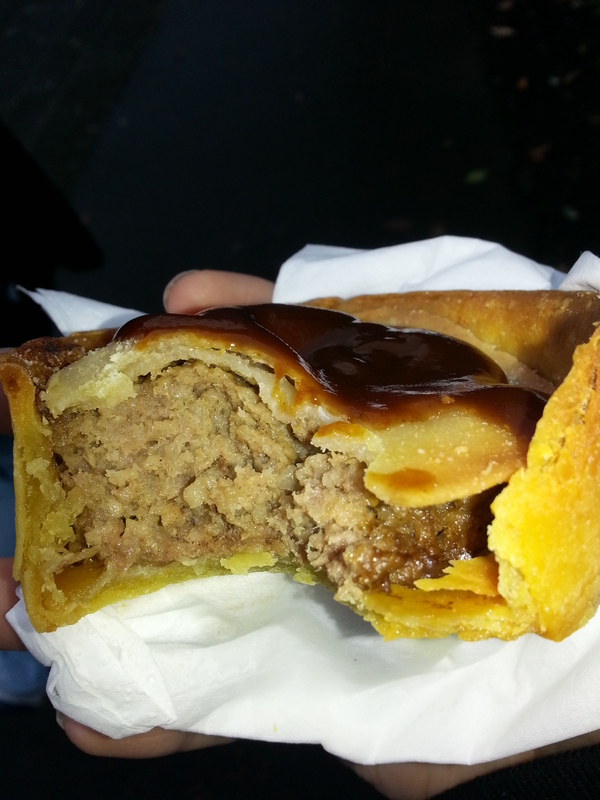 It was well seasoned and had a lovely bite with a meat and pastry combination amongst some of the best I’ve had. My only negative was that unfortunately when I went to get a second just before half-time they had run out, and to run out before half-time is over is simply unforgivable. Gravy Factor: The kind of gravy I wish I could have had more of at the time. Many a chef will always advise to ‘leave them wanting more’ but when it comes to a pie at a football game I don’t want to have to go without, even if it is seconds. Another pie down and if you have read this far down then I know you are keen and like the words I write so I will give you my bonus resolution and let you do with it what you will, it simply reads: Get a Free Pie. Remember you can visit www.footballbloggingawards.co.uk where I talk football in a non pie based manner, my latest entries look at the rules surrounding football celebrations and a look at how we as fans can help deal with homophobia in the game we all love. My next tale of pie will be at as a yet to be determined location as the weather is playing havoc with my sporting adventures at the moment but as soon as I know I’ll get it put on Twitter. 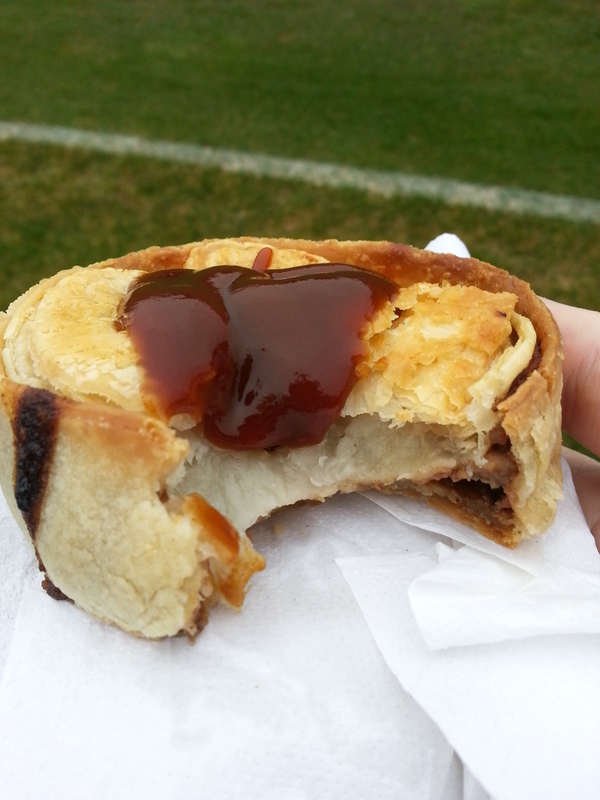 This entry was posted in Football Pies, Junior Pies, Sporting Pies, The Life of Pie and tagged bovril, brown sauce, Football, free pie, Gravy, junior football, kilbirnie ladeside, Meat, meatfilledmerch, meatfilledpastries, Pie, pollok, scotland, SuperLeague. Meat Filled all the way. I was going to apologise for going all festive on you but in reality I’m really chuffed with that. Hello my fellow pie connoisseurs and welcome to another entry into the best football based pie site around. As Christmas comes closer shops across the country are stocking those most festive of treats, mince pie’s, and I am not excited in the slightest. But you’re the Pieman, Mr. Pie, Sir Meat Filled of The Pastry Roundtable, yes these are all true but I have never been partial to a mince pie or the candied peel nature of Christmas desserts. However, this year in the spirit of this here misadventure I am pleased to announce that I now think mince pies are….alright. I still think they have the distinct aftertaste of ear wax but I can munch my way through one in a social surrounding without looking ungrateful at what has been put before me. Anyway back to the proper stuff and the journey of Meat Filled Pastries’ rolls on to Largs, home of ice cream and Vikings (apparently). Price: £1. Amongst the cheapest pies that we have come across on our journey so far. Presentation: Today’s presentation will be presented in the form of a riddle. It is not as black as night, and neither generous or stingy. I’m not going to give you the answer if you have read enough of these by now you know what I’m getting at. 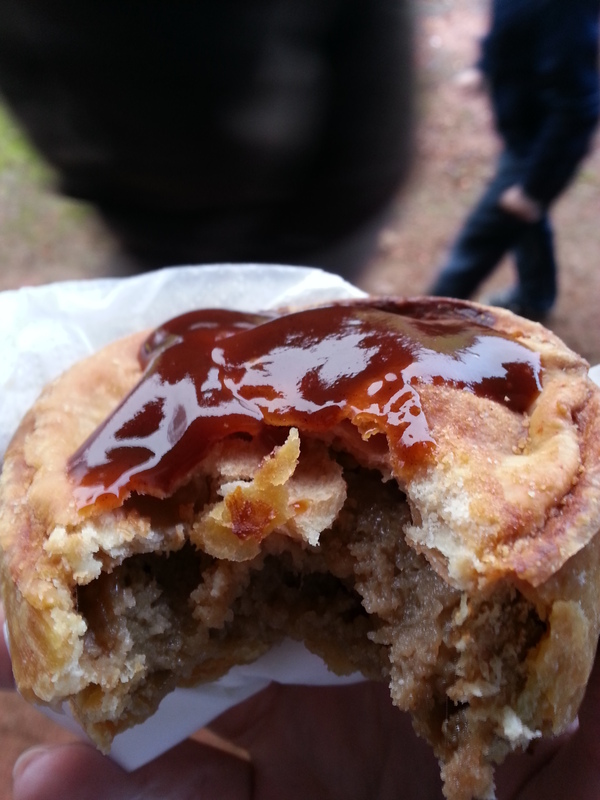 Meatiness: Unless my taste buds were deceiving me this was not your standard mutton pie. It was a tad disconcerting at first, and to fully get my taste buds around it I required another couple of bites but the filling inside was strong in it’s taste of lamb. There was no taste of pepper in this pie which I think only helped to heighten my initial confusion. After my taste investigations I would say this was a really well seasoned lamb mince pie as opposed to a standard mutton scotch pie. Now with this confusion firmly put to one side I could focus on the other elements for consideration. It was well filled if not a tad uneven, the meat inside had a nice bite that held well but for some reason I felt a slight film of grease forming each time I moved the pastry away. On appearances this was by no means a greasy pie but I wonder if the lack of pepper I usually find in the scotch variety was causing confusion in my pallet. It was certainly tasty but definitely not what I was expecting. Pastry: This was a crisp golden pastry with a lovely buttery flavour, however it was so crisp that it caused me to roll my tongue around my teeth to check for chips when biting down. In fact, the crucial ‘one bite expose’ you see above had to be doctored a bit as on first bite all I was provided with was a shard of pastry. The pastry though was definitely one of the better efforts I have come across but be warned that your first bite should be taken with caution in mind. Overall: Disconcertion’s aside this was a tasty pie and as it came in at only a quid it was certainly worth the money paid. The pastry was a little too crisp, it would have been better without the faint hint of grease that accompanied every bite and or my taste an extra peppery kick would have been nice. However there was a good splodge of brown sauce available to provide that flavour boost. Everything tasted good but could have been made even better. Gravy Factor: Made not with gravy granules, but one of those fancy stock pots. A different take on your standard gravy. Another pie down, another 10 minutes on the treadmill added to the routine. The plan is to visit next one of the most recognisable names in junior football Auchinleck Talbot but that involves some serious negotiations when I get back into work that I reckon will be doomed to failure. 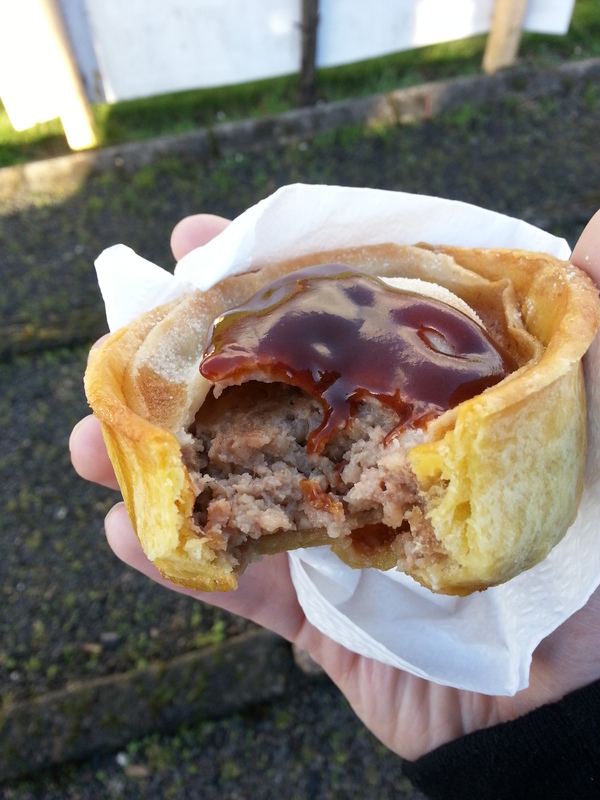 I think we can all agree that Saturday afternoon’s should be spent with pie in hand, scarf round the neck, watching 22 men kick about a synthetic leather sphere especially when you run a site based on the consumption of these meat filled beauts. However until next time, whenever will that be, go forth and eat pie! 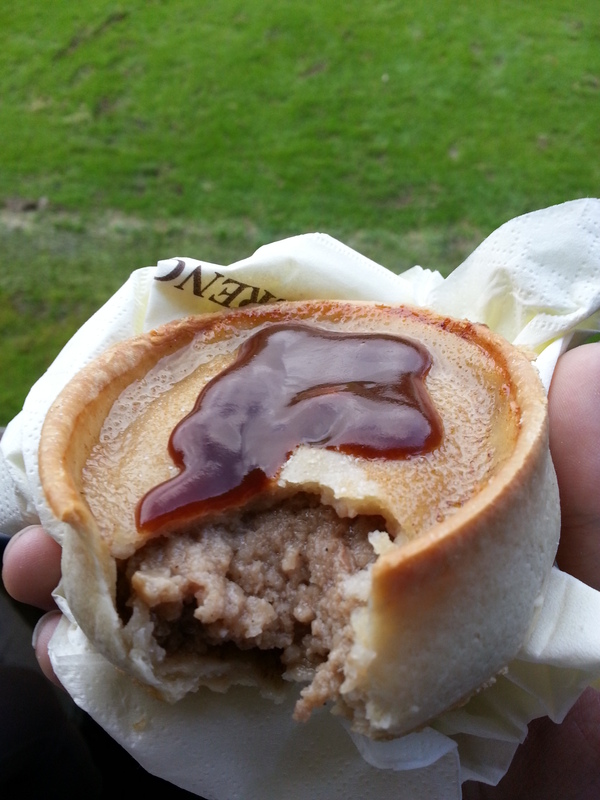 This entry was posted in Football Pies, Junior Pies, Sporting Pies, The Life of Pie and tagged aucinleck talbot, brown sauce, Football, Gravy, junior football, lamb, largs thistle, Meat, meatfilledmerch, meatfilledpastries, pastry, Pie, pollok, sjfa.